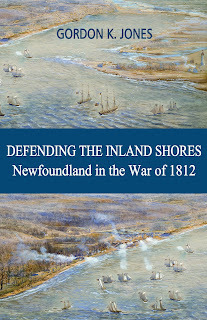 The World of Gord: My Interview with Canadian Military Family Magazine for "Defending the Inland Shores"
My Interview with Canadian Military Family Magazine for "Defending the Inland Shores"
Armed with his passion for the War of 1812 and desire to uncover Newfoundland’s role in the war, first-time author, Gordon Jones’ s book: Defending the Inland Shores: Newfoundland in the War of 1812 was released this past December. It all started when Jones and his wife were on vacation in Newfoundland several years ago. During their visit, the couple attended a Battle of Signal Hill reenactment. While Jones tried to capture the action with his camera, Jones’ wife struck up a conversation about the War of 1812 with others at the reenactment. “They basically had no idea about what went on, and once she told me I thought it was a great shame because they played such a significant role, a big of a role in the War of 1812 as they did in World War One percentage basis,” explained Jones, who’s grandfather served with the Newfoundland Regiment in the First World War and father served in the Canadian Army during the Second World War. Upon returning home, Jones looked for a book to learn more but couldn’t find any and decided to write one himself. It’s taken him three years of researching, pouring over books and letters, anything he could get a hold of at the reference library in Toronto, to finish writing the book. During the research process, Jones came across a nine-volume set of letters written by generals and other participants of the war that helped pave the way to finding unique information. Through his writing of this book, Jones has learned a great deal about the War of 1812, little tidbits of information that perhaps now one else knows of. “To really get down in the nitty-gritty of stuff, it was thrilling and exciting. I’ve been studying this war for 30 years, and I was finding information that I never knew happened before. I’d just come out of the backroom with a big smile on my face sometimes because I just found this nugget of gold,” said Jones. The writing process was something that came with time for the first-time author, who works in the financial world, but he ended up finding an exciting action sequence to open the book with, and the rest just fell into place. “Once I had the framework of how I wanted to do it, I’d just go out research the heck out of a chapter and I’d sit down with all my notes, books and bookmarks and just go at it,” recalled Jones. Now that the book had finally been published Jones feels a sense of accomplishment and is looking forward to finally sharing his work with others. “Hopefully when they read this book they’ll see that yes Newfoundland was a great contributor and Newfoundland suffered a lot in the war. I hope that people that have researched the war read it and get some information they never knew before,” said Jones. Defending the Inland Shores: Newfoundland in the War of 1812 is now available for purchase on Amazon, Indigo, all major online retailers and independent bookstores.